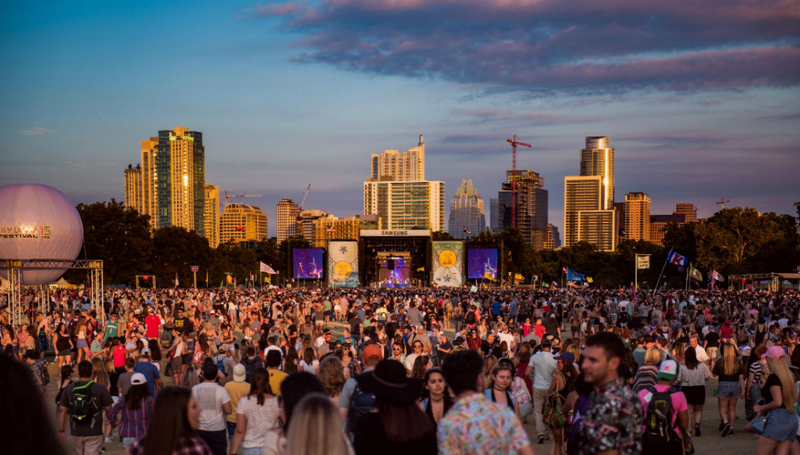 Austin City Limits music festival, now celebrating its 15th year, has had to fight hard for relevance and identity when you consider how many festivals are now on offer. Despite its relative youth, it has a sense of history attached to it through its association with the ACL TV series, now in its 40th season, and in general with Austin's tag as 'the live music capital of the world.' Credit must go to C3 Presents, the company that also organises Lollapalooza, that the festival (albeit spread over two weekends) not only attracts over 450,000 attendees but also now has the pulling power to have a lineup chock full of legends and current chart-dwellers spanning the full gamut of genres. Problems with the two-weekend format have also improved; last year's headliners Florence And The Machine could only play one weekend due to a scheduling clash, but this year Chris Stapleton was the only notable absence on the second weekend. Austin is, of course, famous for its country music, but ACL falls into no such pigeon hole. It has always been a point of debate what music 'belongs' at a music festival ("I'm not having hip-hop at Glastonbury. It's wrong"), but just as Jay-Z roundly stuffed Noel's jibes back in his mouth, paving the way for hip hop to become a festival force to be reckoned with, now festivals must take account of the explosion of EDM in the charts over recent years. Against these trends and currents, however, the weekend has more than enough to succour the traditionalists; Willie Nelson's first performance at the festival in 10 years, introduced by Matthew McConaughey as the hype-man and then joined on stage by several of the festival's other headliners at the end, is a triumphant victory of classic craftsmanship when surrounded by laptop-centric shows that would have made Willie's plaits tremble. Indie rock is also of no diminishing significance despite these trends; When the line-up was released in May, Amy Corbin, who runs booking for the festival, claimed that ACL had been wanting to get Radiohead on the bill "since the beginning". Thom Yorke, celebrating his birthday on the second weekend performance, addresses the contrast between festival interests, when he tells anyone who wants to watch Major Lazer, playing at the same time at the other side of the field, to "bugger off". The debate should not be about what genre is worthy, though, it should be about the approach of an artist, both to creating music and to performing it. The best acts of the weekend, personally speaking, are those that clearly appreciate the impact of their music, and take just as great pleasure in giving the music as the adoring crowds take in experiencing it - performance should be a mutually symbiotic act. Up and coming Atlanta hip hop artist Raury is stunning on the opening morning. He is ludicrously charismatic, showing stage presence that is unparalleled for the rest of the weekend. His songs belie a vulnerability behind this bravado; minutes after getting the crowd to chant "We all need life", we are told in the chilling 'Butterfly' that "Sometimes I have visions of suicide". Saturday proves that Two Door Cinema Club are as euphoric as ever; a nostalgic return to 2012 through the likes of 'Next Year' and 'Sleeps Alone' followed by their new single 'Gameshow' renews excitement for their upcoming LP release. On the final day, New Zealand country artist Marlon Williams breaks hearts with a set that displays his remarkable vocal control alongside mature musicianship; the enjoyment that he takes in playing with the Yarra Benders is evident, hugging them before the set, and howling together through the foot-stompers. He's then left isolated onstage for a rendition of Leonard Cohen's 'Bird on A Wire' that pierces the souls and tear ducts of everyone watching. It is, in fact, in this small tent, an oasis of calm abstracted from the beats and drops out on the larger stages, that some of the more special gems of the weekend can be found: Corinne Bailey Rae's new material, especially 'Do You Ever Think Of Me', provides a refreshing breeze of cool to the sweltering heat of the Texan sun; Avery Sunshine forces a smile from anyone who witnessed her set, which calls back to the likes of Al Green and James Brown; Gregory Porter's soulful baritone is a force to behold, yet he is humble enough to give the stage to his band to round off the hour. In all these cases, there's no arrogance or superiority to be seen, merely a gratitude from performer and audience alike that they are sharing a weekend of mutually adored music in a stunning setting. This is perhaps epitomised on the final day, when Nathaniel Rateliff thanks the large crowd of the Samsung stage for their support and attendance between almost every song. Scattered amongst the arms-aloft barn-stormers of 'I Need Never Get Old' and 'SOB' are pearls of whimsy with 'Wasting Time' and 'Don't Get Too Close', such that he is the one breathing in the experience just as much as any of us below, fully in the knowledge of what he had come through over the last couple of years in order merely to be there. Beyond these more emotive acts, there is no shortage of pure fun, without wanting to draw some sort of Aristotelian dichotomy between higher and lower pleasures. Flight Facilities stand out on an opening day with countless electronic acts on offer (M83 and Flume being scheduled at the same time seems to be an organisational error, but is unavoidable when trying to fit in so much of the same); adorned in Airforce attire behind their laptops, the beguiling Michaela Baranov act as their vocal channel in front, swimming to the beats around her. On the second day, Jack Garratt, an artist whose hype and Brit awards I had previously treated with scepticism, gives his all in a pumped up set, and his multi-instrumentalism as a one-man band is truly impressive, playing drums, keyboard and synth simultaneously - a Jack of all trades, master of most, if you will. Crowds are always going to enjoy watching an act who has graced most Summer 2k16 Beach playlists, but it's infectious how much he enjoys himself and refuses to take himself seriously, especially on his party-trick mash-up of Craig David's '7 Days' and Justin Timberlake's 'Señorita', which followed a self-parodying attempt at 'The Fresh Prince Of Bel Air'. The final day sees Porter Robinson and Madeon dazzle with their electronic collaboration: it's just unfortunate that the excitable crowd drawn by Young The Giant on a nearby stage ends up drowning out some of their effort (the only instance of stage proximity causing an acoustic clash, so some sympathy must be given.). On top of this extensive depth of upcoming and current talent on offer, the headliners elevate the experience to the legendary. Radiohead show why their presence at the festival was so sought after; new material from A Moon Shaped Pool fits seamlessly into their set list of older classics, with every album represented at least once. However, it's interesting (and a shame for this reviewer) that 'True Love Waits', a live staple for over 20 years is not now performed despite finally making it onto a studio album. 'Burn The Witch' opens with menace as Yorke screeched into "This is a low flying panic attack"; 'Daydreaming' is predictably melancholic but manages to maintain the intensity. The visual displays make for a particularly phenomenal experience, galvanising the crowd into a frenzied freak-out. Having changed their set list from the opening weekend, 'Fake Plastic Trees' jerks tears and tore heartstrings to finish a landmark performance. In contrast, Kendrick Lamar is somewhat disappointing on the middle evening: the music is, of course, a masterpiece, but while his groundbreaking appearance at the Grammy's this year had demonstrated how visual performance can mediate and augment the import of his lyricism, it feels underwhelming. The monochromatic visuals are understandable given the content, but leave him looking isolated and insignificant on stage, making Schoolboy Q's entrance halfway through a relief. The final night, however, returns to form, as LCD Soundsystem make everyone grateful for their reformation. They've been playing a number of festivals on their 2016 tour, but manage to be so enthused and energetic as to create a raucous revelry below them. Neon Lights and disco balls scatter the darkness as they move from epic hit to epic hit (When met with boos after announcing there are only two songs left, Murphy jokingly reassures the crowd that, "Knowing us that will still be twenty minutes!"). This is a festival dominated by positive feelings of shared love and enjoyment. If the bubble of Glastonbury's mood this summer was burst by Brexit, the impending implications of November's election are not too late to change, making the mood one of defiant hope rather than defeatist gloom; Flying Lotus wills his fans to "avert the apocalypse" with their votes, and there's a sense, perhaps naïvely, that through the cohesion of music and people of such vibrancy and variety as demonstrated at this festival, change isn't altogether impossible. It's that un-self-aware live and let live attitude which makes this fledgling festival, and Austin as a city in general, so special. This attitude makes any critical cynicism difficult to maintain; although Catfish and the Bottlemen provide wholly vacuous guitar-music-by-numbers, the fake-ID crowd are delighted to be pandered to, singing along to every word as if their lives depend on it, stretching arms high and smiles wide - depressing for the future of guitar music perhaps, but the excitement of so many is something to be encouragingly embraced rather than cynically disparaged. Similarly, I'm not embarrassed to say how much I enjoy the final half hour of Mumford and Son's set. Alright, two hours of sincere verses leading into thrashed choruses might have become tedious, but in the cool twilight of an unforgettable weekend, it's impossible not to shout along to 'The Wolf' and 'I Will Wait'. As if in response to James Murphy's wishes to "see all my friends tonight", Marcus Mumford calls up the perfectly suited Gregory Porter and the begrudgingly entertaining Haim for a collaborative cover of Joe Cocker's version of 'With A Little Help From My Friends'. They had performed this stunt at Glastonbury 2013 and Bonnaroo 2015, but it seems most apt for this Austin environment. It's a performance of unbridled enjoyment and fraternity that sums up this special festival. Austin does cool better than any other place because it cares so little about being cool.